Epilobium There is 1 product. Alpine belle rapid growth creeping rhizomes. 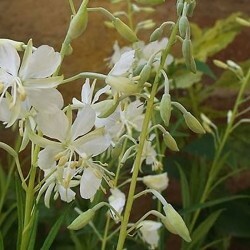 Large graceful stalks of flowers "butterfly" white. Deciduous foliage. Background massif.tout drained soil, dry and poor.